“Eaton Parking Lot,” Louisa Street looking south from Elizabeth Street, 1925. City of Toronto Archives, Fonds 1244, Item 1002. The Armouries were among the first institutions to encroach on the Ward. Eaton’s department store followed closely. 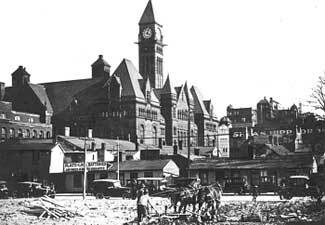 Fifty dwellings were demolished to accommodate Eaton’s factories behind Old City Hall just before World War One. Ironically, the company was also the largest single employer of the Jewish neighbourhood residents: Eaton’s was one of the few employers that did not insist on Saturday work. The construction of the Toronto General Hospital in 1913 entailed the destruction of 232 dwellings. By 1916, the neighbourhood was made up of 50% houses and shops, 26% public buildings, the rest being taken up by streets and sidewalks. Some contemporary observers rejoiced and hoped that the gradual encroachment of public and corporate buildings would lead to the demise of the district. Albert Street, looking east from Chestnut Street, 1955. Toronto Public Library (TRL), J. V. Salmon Collection, T 33961. The lumberyard at the south-east corner of Chestnut Street and Albert Street stood across the street from Osgoode Hall for almost one hundred years. Beside its official purpose, the yard was a favourite playground for the neighbourhood’s children and occasionally a refuge for the homeless. This photo was taken just before the property was expropriated to make room for the New City Hall. 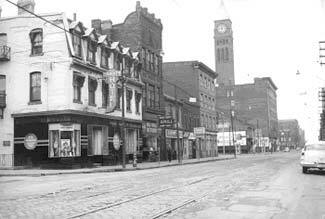 Queen Street West, north side, looking east from Chestnut Street, 1955. Toronto Public Library (TRL), J. V. Salmon Collection, T33876. In 1833, the residents of this section of Queen Street were mainly tradespeople, but included professionals such as Marshall Spring Bidwell and Dr. John Rolph, both benchers of the Law Society. Most of the inhabitants of the neighbourhood had Anglo-Saxon names. In 1856 the cultural representation remained the same. The street was home to grocers, a custom house employee, a medical student, long-term resident Dr. Rolph, a fish monger, a cabinet manufacturer and a bonnet maker. By 1878, the street had acquired a definite commercial tone. One could purchase shoes, fruit, milk, sausages and tobacco a few steps from Osgoode Hall. Most of the names still hailed from Great Britain, with a sprinkling of Jewish names and one Chinese laundry. University Avenue, looking north from Queen Street West, c. 1930. City of Toronto Archives, Fonds 1231, Item 1502. The Canada Life Assurance Company building was opened in 1931. When completed, the 17 storey, 276-foot building designed by the firm of Sproatt and Rolph was the tallest building on University Avenue. Its weather beacon was added in 1951. The early development of University Avenue and the construction of buildings such as the Armouries, the Toronto General Hospital and the Canada Life Assurance building held the promise of a stately urban avenue. The office tower development of the 1960s and 1970s made it what it is today. The first plans to extend University Avenue southward beyond Queen Street were discussed in 1918. The issue came up again in 1929. The proposal at that time included the extension of the street and the construction of a large traffic circle at the level of Richmond Street. 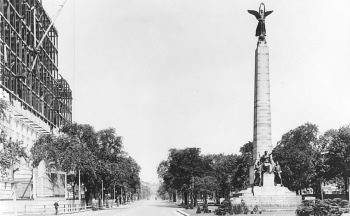 A war memorial was to have stood prominently at the centre of the plaza to be called Vimy Circle. Construction of buildings on the new section was to be strictly controlled, in keeping with the vision for the whole Avenue. Billboards, illuminated signs and overhead wires were to be forbidden. 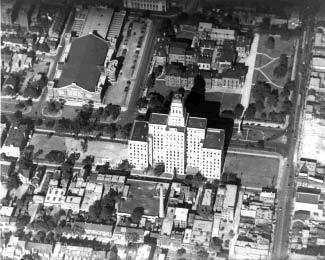 The Depression put an end to that grand scheme but University Avenue was nevertheless extended in 1931. Shea’s Hippodrome, Bay Street, 1953. Toronto Public Library (TRL), J. V. Slamon Collection, S 1-1215. Osgoode Hall sat on the fringe of Toronto’s old theatre district. Massey Hall, the Loew’s Winter Garden, the Casino (which was a popular striptease house for part of its existence), and the Broadway Theatre all stood within walking distance of Osgoode Hall. 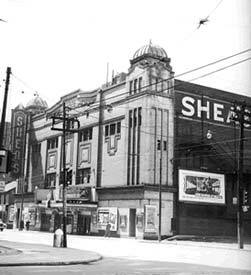 Shea’s Hippodrome was one of the many theatres owned by the Ontario-born Shea brothers. When built in 1914, the Hippodrome was the largest theatre in Canada and one of the biggest in the world, with 3,200 seats. Some of the best Vaudeville acts in the world performed on its stage. 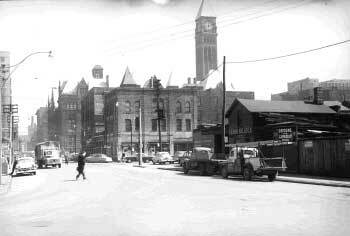 The “Hipp” was demolished in 1957 to make room for New City Hall. The theatre’s great Wurlitzer pipe organ was rescued by Maple Leaf Gardens where it stayed until 1964. It can now be seen, somewhat modified, at Casa Loma. The construction of the New City Hall dealt the Ward a final blow. Not only were several blocks of buildings demolished, including some structures of the second generation such as the Registry Office, but streets disappeared as well. The site of City Hall had been considered as early as 1911 as the location for a civic complex. The failure of the early plans led to piecemeal development in the area until the unifying influence, architecturally at least, of the New City Hall project. 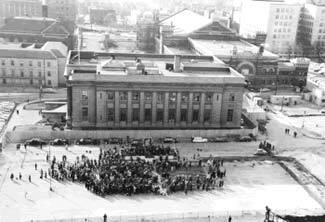 The Armouries were demolished in 1963 to make room for the courthouse at 361 University Avenue. “The Last Bay-Dupont Streetcar,” 1963. City of Toronto Archives, SC567B-130-1. 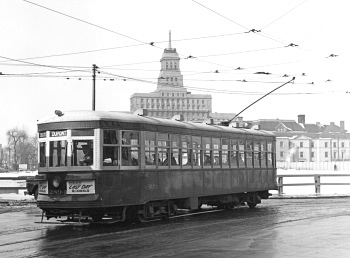 This photo was taken on the last day of the Bay-Dupont streetcar. The route was abandoned when the University subway line opened on February 28, 1963. The streetcar route had survived the opening of the Yonge line in 1954 because of the traffic on Bay Street. The second subway line and a climate of streetcar elimination made it redundant. The University line was created to service the financial, government and commercial institutions along University Avenue and to relieve the pressure on the Yonge line after the opening of the Bloor line. Ridership was so light in the early years that the line was closed on evenings and Sundays from 1968 to 1978. 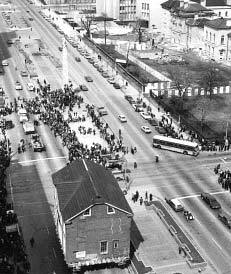 The move of Campbell House, University Avenue, looking north from south of Queen Street West, March 31, 1972. Photo courtesy of Campbell House, reproduced with permission of the Toronto Transit Commission. Campbell House may be one of the oldest houses in Toronto, but it is a new neighbour of Osgoode Hall. The house, built in 1822 for Sir William Campbell, formerly sat on Duke (now Adelaide) Street, at the top of Frederick Street. The building was saved from demolition by the Advocates Society, which bought the house for one dollar. The Sir William Campbell Foundation was created to raise funds to move the house to new grounds. The Canada Life Assurance Company agreed to lease the house’s current location for one dollar a year while the City accepted to forego the property taxes on the lot. The 300-ton house reached its new location after a 6 1/2 hour trek through downtown Toronto. The Law Society of Upper Canada Caretaker’s Cottage, c. 1955. The Law Society of Upper Canada Archives, P412. Osgoode Hall has had to share its six acres with other structures over the years. The grounds have been occupied by wood and coal sheds, a carriage house, a stable, a boiler house and lavatories. In 1886, the west lawn was turned into tennis courts for law students. More substantial structures were also erected on the property. The caretakers of both sides of Osgoode Hall lived on the premises and cottages were built for their accommodation. 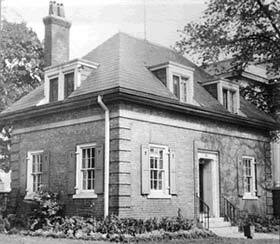 The Law Society’s cottage was demolished in 1957 to make room for the Law School. The government’s cottage was destroyed a few years later in preparation for the construction of the new courthouse. In the last few decades, plans calling for an eleven-storey tower on the west lawn and for an underground library under the front lawn have been considered and abandoned.